As you probably know, the 99th running of the Indianapolis 500 is scheduled to take place on May 24th. As a result, drivers are out testing on the legendary 2.5-mile oval at Indianapolis Motor Speedway all week, and in typical Indy fashion, there have already been a couple of wrecks. Pippa Mann and Simona de Silvestro were victims of tow separate incidents during Indy practice, with Mann crashing into the infield wall and Silvestro’s car catching on fire after a mechanical failure. Those incidents pale in comparison to the wreck Helio Castroneves suffered after losing control of his car when exiting turn two, though. 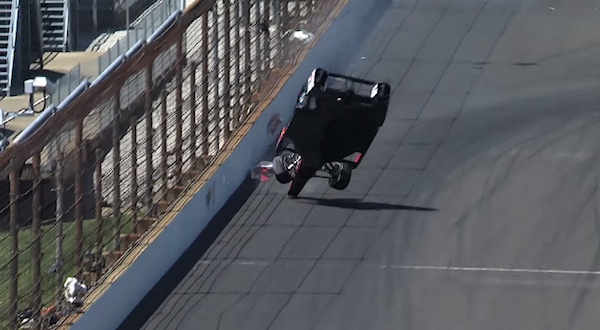 For some reason, Castroneves’ Chevrolet gets a little squirrelly when exiting the second turn at IMS, causing it to spin 180 degrees, clip the outside wall, and flip spectacularly before landing upside down and coming to a rest right-side up. Luckily Helio didn’t get jetted up into the catch fence and was able to walk away from the incident unscathed. Crashes like these are a reminder that racing highly capable open wheel cars such as the Dallara DW12 on a high speed oval can be very dangerous. Luckily the DW12 is an extremely safe car and will hopefully keep all racers safe from injury when the green flag waves for the Indy 500 on May 24th.